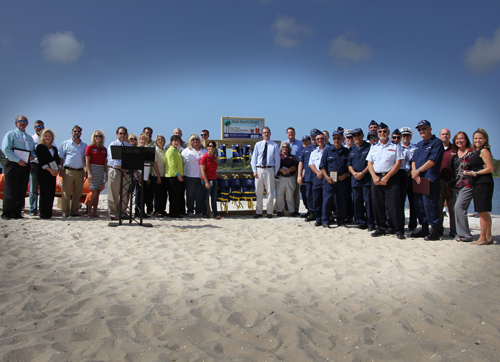 Life Jacket Loaner Program Launched in Collier County! Our Coalition in conjunction with the Collier County’s Parks and Recreation Department launched the“Kids Don’t Float, Lifejackets Do,” lifejacket loaner program at Sugden Regional today! Modeled after the “Kids Don’t Float-Give Them Something That Does,” initiative adopted in Alaska in 1997, the program will place loaner lifejackets at area beaches. There will be 20 lifejackets per station with four adult sizes, four sizes 10-18 years, five sizes 5-10 years, and seven sized for children five and under. 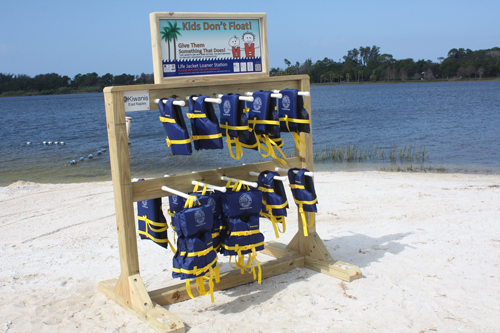 Collier County’s Parks and Recreation Department constructed the stands and signage for the lifejackets. The U.S. Coast Guard Auxiliary Flotillas 93, 95 and 96 will check monthly the condition of the lifejackets. If any lifejackets are missing or in disrepair, they will be replaced. The life jacket loaner stations will initially be placed at 5 lake/beach locations: Sugden Park, Clam Pass, Vanderbilt Beach, South Marco Island and Tigertail Beaches. The Coalition eventually hopes to expand the availability of the loaner life jacket program throughout Collier County and the City of Naples. The mission of our drowning prevention committee is to achieve and sustain a zero drowning rate for children in Collier County. This ambitious and cooperative program will provide another layer of protection against drowning, the leading killer of children one-to four-years of age in Collier County.